The shape of our hands comes from tree-dwelling ancestors. You are accessing a resource from the BioInteractive Archive. Archived resources are not updated to reflect current scientific knowledge, technology, and/or pedagogy. These two female rhesus macaques (Macaca mulatta)—mother on the left with her daughter on the right—are on the island of Cayo Santiago, off the northeastern coast of Puerto Rico. 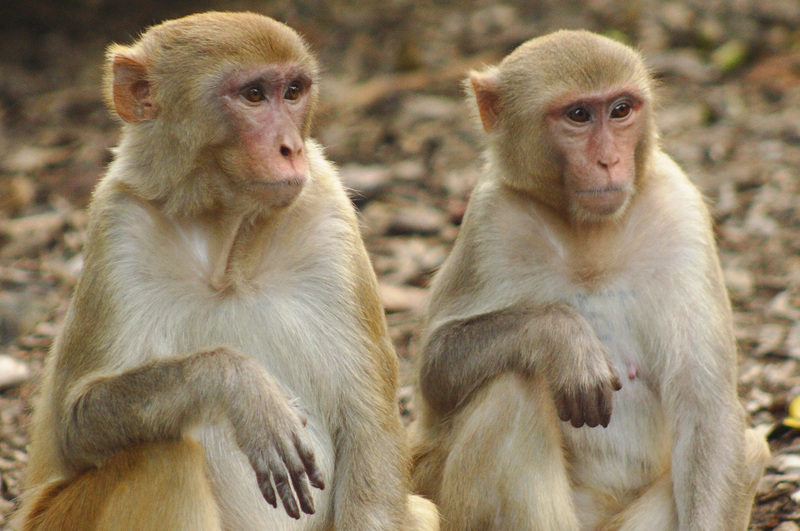 Rhesus macaque monkeys live in groups of multiple males and females. Their hands have long fingers with nails and a divergent thumb, which they use for grasping food in trees and for social interactions, such as grooming. The hands of humans and rhesus macaques look very similar. That is because we share an evolutionary history that can be traced back to a time when our ancestors lived in trees. To learn more about the evolution of our hands watch Your Inner Monkey, episode 3 of Your Inner Fish on PBS, and find related resources at www.biointeractive.org/your-inner-fish. By downloading, you agree to the permissions to use this file. This interactive module sheds light on the evolutionary history of humans by comparing the features of a prehistoric primate skeleton to those of modern primates. This interactive module explores different anatomical features of the human body and what they reveal about the evolutionary history of humans.